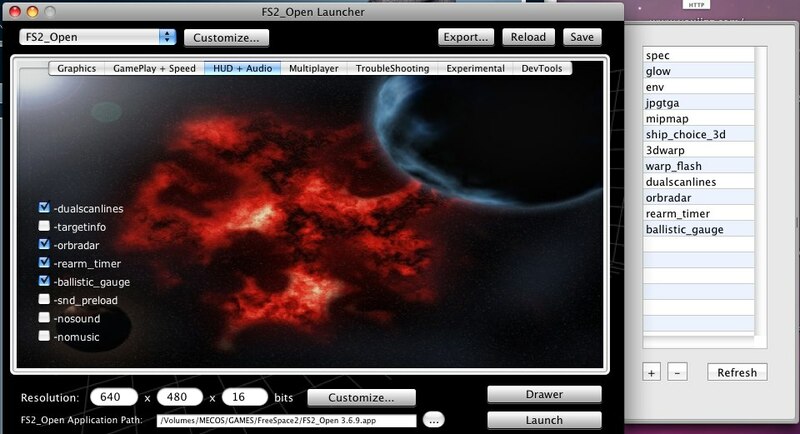 FS2 Open Launcher OS X will allow you to change the command line arguments of FS2_Open (the open source port of Freespace 2 from Volition) without having to mess around with the command line file that resides into the user’s Library. It will also allow you to change the resolution of the game. It was featured on several magazines and many locations on the internet as the absolute companion to the OS X version of FS2_Open. NOTE: VERSION 3.1 WAS RELEASED. REDOWNLOAD! Get the application here . –Checking for updates on the internet via Sparkle. –Standalone Mod Support. You can set up your own configurations. You can view the changelog for the application here. After you download the application, please perform a “check for updates”. It will surely find a new version. Download the latest version using the auto-update feature. This is due to the project being hosted in a different server. Sorry for what inconvenience that may cause. Universal Binary. OS X 10.4 or newer. If you want to know what exactly is FS2_open, you can go here.